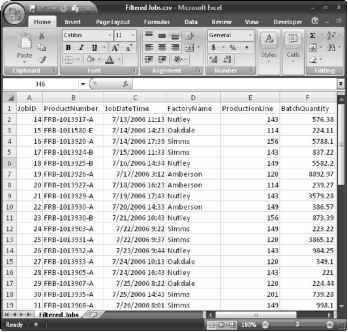 The main menu of the sample application, External Data.accdb (shown in Figure 10.10), has buttons for opening various forms that import and export data in a variety of file formats. Writing VBA code to do the imports and exports gives you one-click convenience, particularly useful if you have to do an import or export task frequently, for example importing weekly Jobs data downloaded from a mainframe computer or emailed as a fixed-width or comma-delimited text file. The main menu of the External Data sample database. 1. Selecting the "Import Data from Text Files" option and clicking the button to its left opens the Import Job Data from Text File (frmlmportTextData) form, as shown in Figure 10.11. If a text file was previously selected, its name is displayed in the textbox to the right of the "Source Text File" button. 2. You can use the selected file (if one is listed), or you can select another by clicking the "Source Text File" button, which opens a File Picker dialog box. The File Picker dialog box is filtered to display either comma-delimited (.csv) or fixed-width (.txt) files, according to the option selected in the Import Text Type option group. In Figure 10.12, I've selected a comma-delimited text file for import. The Import Job Data from Text File form, as initially opened. 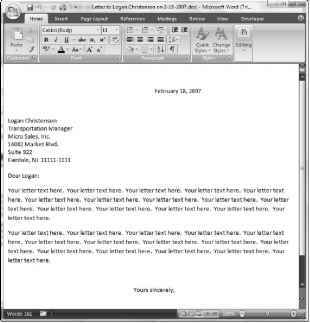 Selecting a comma-delimited text file for import. 3. After selecting a text file, click the "Inspect New Jobs from Text File" button to import data from the text file to a temporary table, tblNewJobs. The code running from this button sets the table as the source object of the Jobs to Inspect subform, so you can see the new records before actually appending them to the tblJobs table, as shown in Figure 10.13. The new jobs imported from a comma-delimited text file. 4. After inspecting the new data, you can either discard the data or import it into the tblJobs table. Clicking the "Clear Imported Jobs Data" button discards the data (it is not added to tblJobs). Clicking the "Save New Jobs to Table" button runs an append query that adds the new Jobs data to tblJobs. The code does some data type conversion (as shown in Figure 10.14), because all the fields in the text file are text fields. An append query that does some data type conversion before appending the newly imported jobs to the main tblJobs table. If you clicked the "Save New Jobs to Table" button, the new records that were displayed on the form were added to tblJobs. Me! [subNewJobs].SourceObject = "" Call SaveTextFile("") Me! [txtSelectedTextFile].Value = ""
Importing data from fixed-width text files has become much more difficult in Access 2007 than in previous versions of Access. Specifications now store the file name internally, and thus you must create a separate specification for each text file you want to create. This means that the flexible method I use, where you can select the file to import, will not work. I recommend sticking to comma-delimited file imports, if possible. Set txtData = Me! [txtSelectedTextFile] strTextFile = Nz(txtData.Value) If strTextFile = "" Then strTitle = "No text file selected"
strPrompt = "Please select a text file"
Debug.Print "Text file: " & strTextFile End If strTable = "tblNewJobs"
Assign table as the subform's source object. DoCmd.SetWarnings False DoCmd.OpenQuery "qappNewJobs" strTitle = "Jobs imported"
Create a FileDialog object as a File Picker dialog box. Set the initial path to the custom Input Documents path. Save the value to tbllnfo; the form can't be bound to that table because the main menu is bound to it, and thus it is locked. Private Sub fraTextType_AfterUpdate() On Error GoTo ErrorHandler Dim strExt As String Check that the selected text file is the right type, and clear the file selection if not. When exporting data to text files (say, for import into a mainframe computer program, or another application that can import data from comma-delimited or fixed-width text files), often you need to filter the data, usually by date. The Export Job Data to Text File (frmExportTextData) form has two textboxes bound to Date fields that you can use to select dates for a date range used to filter the records to be exported to a text file.
. i- ^ y- v- -p^. i-j?'. *rJ3 Controls bound to Date fields on an Access 2007 form have a long-awaited feature shown in Figure 10.15: a pop-up calendar to make it easy to select a date. The Export Job Data to Text File form, with a pop-up date selector. 1. 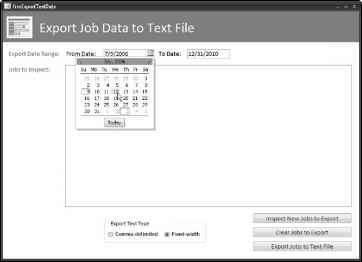 To open the "Export Job Data to Text File form (frmExportTextData), select the "Export Data to Text Files" option on the main menu and click the button to its left. This form lets you export a range of records filtered by date to either a comma-delimited or fixed-width text file. 2. After you select the From Date and To Date, either by typing them in or using the date selector pop-up, click the "Inspect New Jobs to Export" button to show the jobs in the selected date range in the Jobs to Inspect (fsubNewJobs) subform, as shown in Figure 10.16. 3. If you don't want to go ahead with the export, use the "Clear Jobs to Export" button to clear the selected jobs. 4. To proceed with the export, use the "Export Jobs to Text File" button to run code using the TransferText method to export the selected date range of jobs to a text file of the type selected in the "Export Text Type" option group. Figure 10.17 shows an exported comma-delimited file opened in Excel (which is the default application for .csv files). Inspecting jobs in a given date range to export to a text file. An exported comma-delimited text file opened in Excel. |ong as yOU always want to export to the save file name, as I do in the sample code. Dim intTextType As Integer Dim strQuery As String Dim strTextFile As String Dim strTitle As String Dim strPrompt As String intTextType = Nz(Me! [fraTextType].Value, 1) strQuery = "qryFilteredJobs"
Fixed-width strTextFile = GetOutputDocsPath() _ &"Filtered Jobs.txt" strSpec = "[email protected]@hyFilteredJobs"
End Select strTitle = "Exported jobs"